Still Life: Tea Set. Jean-Etienne Liotard, 1781-3. The first tea cups to arrive in Britain were mismatched, handle-less Chinese porcelain used primarily as ballast on the clipper ships. Matching sets were not purchased until the eighteenth century with the development of the British ceramic industry. Inviting people over for tea took off as a way for the hostess to show off both her purchasing power (tea and tea sets were prohibitively expensive) and manners (in knowing how to serve it). 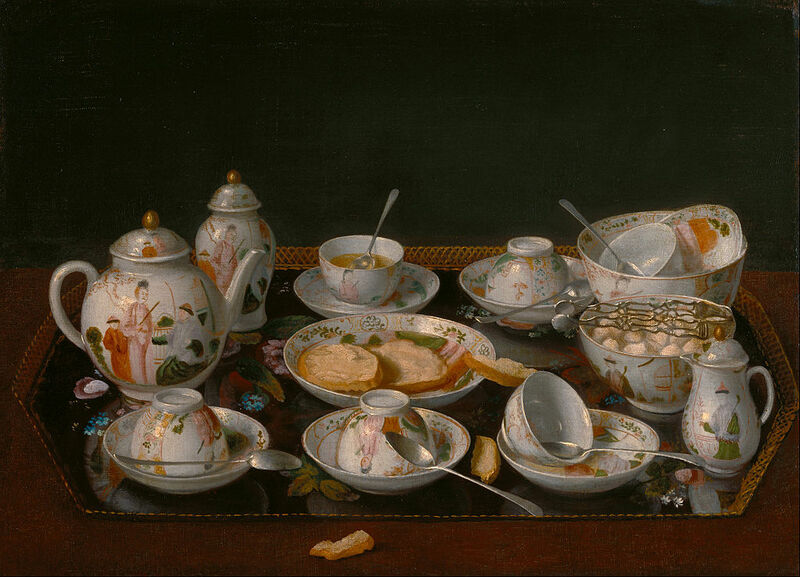 Although tea was hugely popular in the eighteenth century, few could afford it. The East India Company held the monopoly on importing it, and on top of the already high prices, tea was taxed heavily. Tea was a luxury item everyone wanted, so to answer the demand for an affordable product, two things became commonplace: smuggling and adulteration. Smuggling flourished. Much tea was smuggled in from continental Europe on small ships, but some was purchased from the East India Company’s own officers who would use the space allotted to them to undercut the company with some private trade of their own. Throughout the eighteenth century, smuggling grew in scale and became more organized, until an anonymous pamphlet in 1780 complained that so many men were employed as smugglers Britain’s agriculture was suffering as a result. Fortunately, tea smuggling stopped abruptly when William Pitt the Younger introduced the Commutation Act of 1784, reducing the tax on tea from an outrageous 119% to a more reasonable 12.5%. ‘British tea’ was a regional substitute for the genuine article that was produced briefly both as an addition to imported tea and as something to drink on its own. Made from the buds of elder, hawthorn, and ash trees, it was banned in 1777 out of concern over the destruction of the trees. Even after the Commutation Act made tea more affordable, merchants added other substances to it to further reduce the price. Green tea was colored with highly toxic copper carbonate and lead chromate. Because of this, black tea became more popular, although adulterated back tea wasn’t much better. Often cut with sheep’s dung, floor sweepings, or black lead, if it wasn’t lethal, it would have tasted revolting. It was made palatable with the addition of milk, which wasn’t much better. By the time it became a common addition to tea in the nineteenth century, milk was often watered down and whitened with chalk dust. 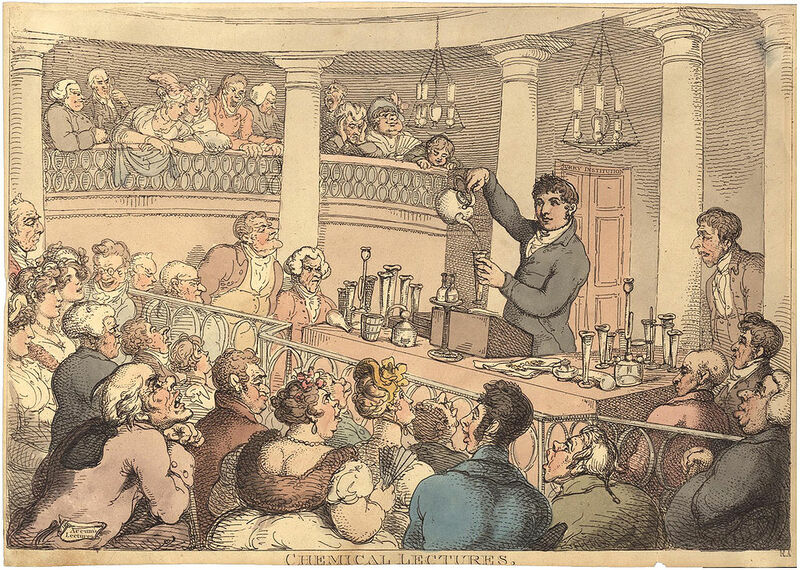 Chemical Lectures by Thomas Rowlandson. Caricature depicting Friedrich Accum. Accum was a chemist and his Treatise on Adulteration of Food (1820) denounced the common practice of cutting food and tea with additives. The public was largely aware of these abuses, and it seems to have been generally accepted as a trade off for an affordable product. Parliament eventually brought in the Food and Drugs Act of 1860, but tea continued to be adulterated throughout the century. Tea had become so cheap by the nineteenth century, that it was a dietary staple for those who could afford little else. It continued to be popular across class lines, and coffee and tea stalls popped up all over London until there were an estimated three hundred in 1840. Encouraged and sometimes sponsored by the Temperance movement, they remained open all day to offer an alternative to alcohol. Coffee and tea were sold in the streets with hard-boiled eggs, bacon, and bread, and many people purchased their meals from these street vendors. Made in cans over charcoal burners, coffee and tea were served in china. People would drink it quickly and return the cup to be (hopefully) washed and used by the next customer. By 1901, the average person in Britain drank an estimated six pounds of tea per year. Tea had become so much a part of British life that the government took over tea importation during the First World War to ensure it continues to be affordable and readily available. Tea was acknowledged to boost morale, and was one of the products rationed during the Second World War. Paterson, Michael. Life in Victorian Britain. Running Press, 2008. Worsley, Lucy. If Walls Could Talk: An Intimate History of the Home. Walker Publishing, 2011. The Diary of Samuel Pepys, entry for September 25th, 1660. The UK Tea & Infusions Association. Catherine of Braganza and Tea Smuggling. 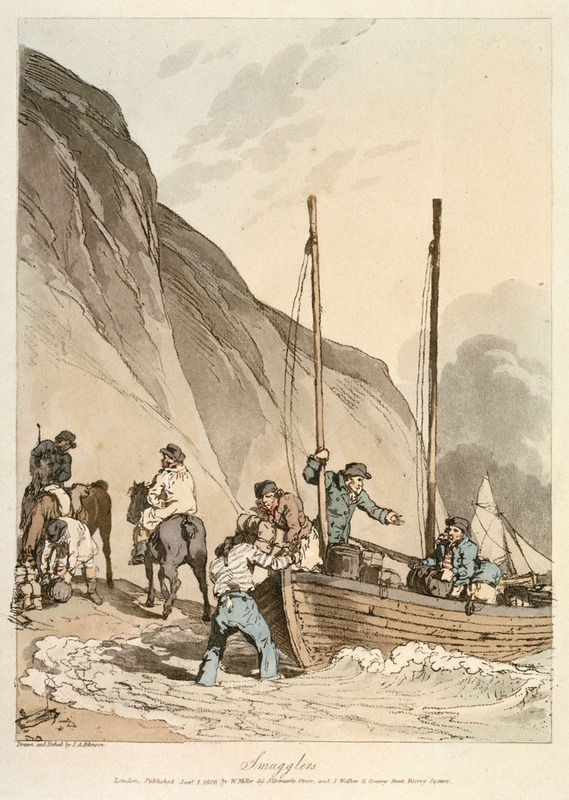 For more on smuggling, read Virginia Heath’s post How Smuggling Shaped the English Language.